Car accidents can leave people struggling with severe injuries. 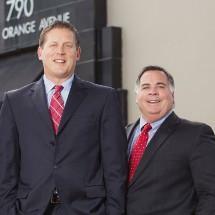 At the law firm of Wieland & DeLattre in Orlando, Florida, our team provides dedicated personal injury representation to clients throughout central Florida. We aggressively advocate on behalf of those who have been injured due to the negligence or carelessness of another person, company or government agency. The lead attorneys of our law firm are AV Preeminent* peer-review rated, the highest rating, through Martindale-Hubbell. For over 35 years, our law firm has represented people and families in cases involving car and trucking accidents, motorcycle collisions, dangerous or defective products, and premises liability. We understand that following such injury accidents, concerns about mounting medical bills and lost wages may further compound the difficulty of people's situations. Our attorneys work to see those we represent made as close to whole as possible, helping them pursue the maximum compensation for their associated losses. Beginning with a free initial consultation, our team strives to create a comfortable environment for our clients in which they can discuss their legal issues and rest assured that they will receive the custom guidance they deserve. We understand that people may have questions as their cases progress, which is why our law firm places an emphasis on communication and accessibility. Our attorneys speak directly with those we represent, providing them with regular updates and addressing any concerns they may have. When people suffer injuries on the job or are left permanently unable to work due to an injury or illness, our team at the law firm of Wieland & DeLattre helps them understand how the state's workers' compensation and Social Security Disability programs may provide the assistance they need and deserve. We accept credit cards for the convenience of our clients. Personal injuries are those injuries that do damage to the "person" and not necessarily to the property of the injured individual. If you have been denied your right to disability insurance income or Supplemental Security Income (SSI) do not give up. Do not be swayed by anyone at the scene – not police, bystanders, passengers or others involved – give no recorded statements to anyone. With all the products being rushed to market these days, it is reasonable to assume that more and more of them are responsible for serious injuries.